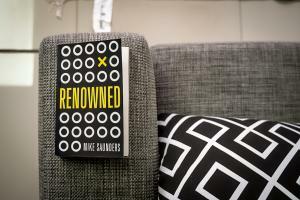 DURBAN, KWAZULU-NATAL, SOUTH AFRICA , April 1, 2019 /EINPresswire.com/ -- Mike Saunders, entrepreneur, author, CEO and conference Speaker, has released his second book – Renowned, A Guide to Building a Powerful Personal Brand Online. Renowned is a book for anyone who wants to unlock the power in their network by leveraging the online world. Whether readers have a sale to make, a business to build, a promotion to get, a message to share or a movement to start, this book will help them amplify and accelerate the work they do. Author, Mike Saunders, recalls the story behind the book. “In February 2010, I received a surprising phone call from a potential client. It was the shortest sales call of my life, made particularly unusual, because I barely said anything. The woman on the other side of the phone simply said: “I have read your blog posts, listened to your podcasts, and I know you are right for the job. How much do you charge, and can I book you for next month?” I ended the call, happy for another consulting engagement, and thinking that the whole thing must have been a bit of a fluke. A few months later, I received another surprising phone call. This time, from the Presidency of South Africa. They said they had done their research and decided that I was the most knowledgeable expert in the field they needed assistance with, and would like to book some time with me. Mike has spent the last 12 months detailing his experiences in building a powerful online personal brand in this book. It is packed with strategic foundations, content development guidelines and a valuable toolkit of the best apps and web-tools he has found to build his brand online. Mike has a passion for education, particularly teaching people how to make the most of technology to improve their life and business. In 2016, Mike released his first book, The Five Year Mark. Created to inspire, The Five Year Mark imparts the lessons Mike has learnt while establishing his businesses. It is also a clear and practical template for entrepreneurs looking for success. Mike’s work as an international keynote speaker means he has had the privilege of working with some of the world’s most prestigious organisations in the world including Vodafone, Beiersdorf, IBM, Toyota, KPMG,and Norton Rose. For more information about Mike Saunders’ book, Renowned - Your Guide to Building a Powerful Personal Brand Online, please contact Stacey Saunders on stacey@brave-narrative.com or check out their website www.mikesaunders.com for all the information you need.